Posh goalkeeper Ben Alnwick celebrates the win at Doncaster. Photo: Joe Dent/theposh.com. 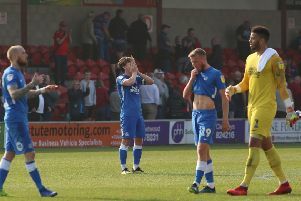 Goalkeeper Ben Alnwick feared a League One relegation battle was on the cards after Peterborough United lost 3-0 at MK Dons on February 21. That fear prompted a few home truths among the players as well as the dismissal of struggling manager Darren Ferguson and the turnaround in just three weeks has been remarkable. A fourth win in a row at Doncaster yesterday (March 14) - when Alnwick was outstanding - means Posh travel to second-placed Preston on Tuesday (March 17) just one place and one goal outside the play-off places. New boss Dave Robertson would set a club record of winning his first five games in charge if Posh can win the game at Deepdale. “We showed nothing at MK Dons,” Alnwick admitted. “There was nothing there at all and I did think after that game that relegation might become an issue. “A few of the lads thought the same and we spoke some harsh home truths among ourselves. Some players had to realise what was needed at this level and to be fair to everyone the response has been outstanding. “The new gaffer and his staff have brilliant to be fair and the work the lads have put in on the training pitch and in games has been excellent. “The return of Gaby Zakuani has been crucial in my opinion because he has the experience some of the other players are lacking at the moment. The way Gaby and Ricardo Santos are playing now, we just don’t look like conceding a goal. “I was pleased to make some saves (at Doncaster), but I’m just doing my job and the team picking up another three points was all that mattered. “The lads have dug me out of a hole a few times this season so it was nice for me to pay them back. “It took me a while to get over a thigh injury. I played with it for five weeks or so, but I wasn’t training much so I had to get it sorted. “I’m clear now and I feel fit and strong which is good as it’s such a critical time of the season. “We’re all hitting form at a good time. We’re defending well and the strikers are taking their chance.